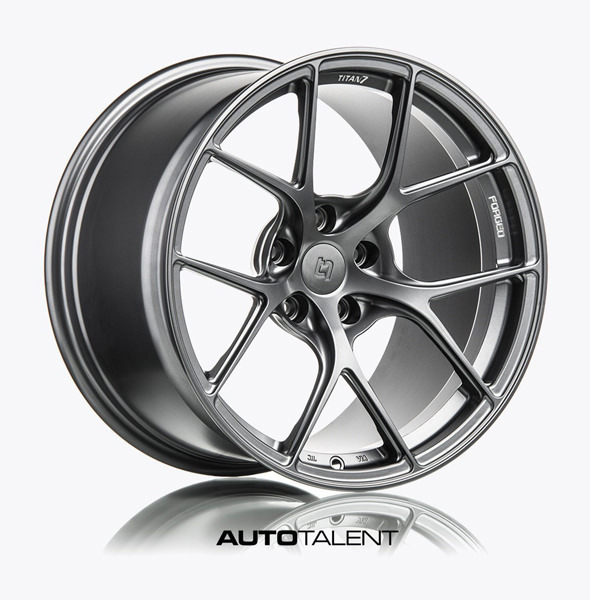 Auto Talent is now proud to present to our fellow MBWorld members, Titan 7 fully forged monoblock wheels! TITAN 7 is a fully forged wheel designed completely with performance in mind. Pressurized with 10,000 TONS of industry leading pressure to give you a wheel that is incredibly strong while giving you all of the performance attributes you need in a track focused wheel. Upon close inspection you will notice strength adding ridges which have been strategically placed to give the wheel rigidity while keeping weight to a minimum. The split 5 spoke design was chosen for its motorsports heritage and track worthy structure. Each wheel from Titan 7 features traction improving bead seat knurling, beefed up inner rim flange for durability and strength, and logo machined accents. The T-S5 is designed for each application to clear all popular after market big brake kits while achieving maximum concavity. All wheels are durability tested according to JWL standards to ensure safety while you perform. Authentic performance from Titan 7. Forged for All. Last edited by AutoTalent; 01-29-2019 at 08:08 PM. Interesting. The founder of Titan 7 came from Mackin according to a thread over on the F80 forum. Seems to have positive reviews there. Is there a satin black fitment? That is true. He was high up in Mackin! Unfortunately, there is only silver available for these cars. We can work out a deal for photos on a custom finish if interested. Do you have pics of them fitted to a car? these look like nice wheels. how are they so cheap? are they Chinese made? what kind of load ratings do they have in our sizes? Unfortunately not. I can work out a deal in exchange for some pictures. They are made in China but they use 10,000 tons of press which is industry leading. Not even BBS or HRE have this high of a level. Ok. yeah BBS's site says they have up to 9,000 tons. Volk/Rays is 10,000 tons as well. But what is actual load rating of these wheels? If they are like 1,500 lbs, then they really aren't strong enough for a heavy car like the C63 for track use, especially with a sticky tire like a PSC2 or a Trofeo R.
The key to Titan 7 Forged Wheels is that we make all of our wheels 100% in house. Everything from design, tooling, forging, machining, heat treatment, surface finishing, and testing is all done in house with no outsourcing. Very few Forged wheel companies can make this claim. This means you get complete quality, performance control, and efficiency. Most wheels that are sold in the marketplace change through many hands. For example, you will have a factory ship to a broker > which is then shipped overseas to an importer > which is purchased by a distributor > then to a shop > then to the consumer. We ship to you factory direct and offer a technically superior wheel to many of the other Forged wheel companies while priced for less. A win win situation. Got it. Waiting on this info and will let you know soon. They did say it will be more than enough. Will update you shortly! I am VERY interested in the load rating as well. That's a must. Just heard back. Load rating is 720kg per wheel which comes out to about 1587 lbs per wheel. I thought that might be the case. Thanks for getting that info so quick! Thanks for the info. To be honest, that’s really low for a forged wheel. Can they do special orders for a thicker spoke design? Thanks for the info though. No worries guys! What makes you think it is not adequate. Rays and BBS come in at the same amount? FYI the Forgeline GA1R forged monoblock is rated at 2200lbs per wheel on street tires. Their rule of thumb - and it's a good one to follow - is that any time an r-compound or slick is used, they cut the load rating in half due to the materially increased forces at work. At the haircut weight rating of 1100lbs per wheel on track tires, the Forgelines are perfect for C63 track duty. I believe the HRE and Vorsteiner forged monoblocks are roughly the same as well but not as light. And for what it’s worth Forgeline use a 6000 ton press, so that data point isn’t really relevant to or indicatative of wheel strength as the marketing speak would have you believe. It’s more about the design and quality of materials than anything else. Cars as heavy as ours aren't typically found on tracks, and not many wheels are cut out for duty. At a post-haircut weight rating of 793lbs per wheel (1587lbs/2) on track rubber, I wouldn't feel even remotely comfortable throwing a C63 around. And the same goes for Rays, or BBS or any others that aren't sufficient after the track-tire haircut to support a car weighing 4000lbs. Just because they’re great well-respected manufacturers doesn’t mean they make suitable track wheels for our cars. Very few actually do. Sure these are fine for the street though. Last edited by BLKROKT; 12-06-2018 at 03:03 AM. My forged wheels are at 2100 lb per wheel due to the spokes being thicker with the same design. I like these wheels, a lot and would sell mine for a set of these if the spokes were a tad beefier to withstand Motorsport activity’s with a 3900lb car. I like everything about this wheel other then the spokes are just a bit thin. Make them a little thicker and give up a little weight for the higher poundage and I’m so in. Great look, better price. So so close. I didn’t respond because I knew BLKROKT would and he’d explain it better than I could. Thanks man! Bump! Happy Friday all. PM me with any questions or for pricing! Bump! PM or Email me at [email protected] for the best prices! Visit our website for our entire collection! Curious if anyone tried these out? While i don't have experience with it on my W204 we have sold about 10 sets of these wheels to a bunch of bmw customers at my shop. Super light, nice finishes, have held up on multiple tracks (watkins glen, NJMP, Limerock, VIR, NYST) so far none of those customers have come back through with any cracks, bends or issues.